Becoming a Christian is the easiest thing in the world – and also the hardest! It is in fact as simple as ABC. Firstly, let's explain what a Christian is not. They are not merely a churchgoer, or a good living person, or even a religious person, for there was a man in the Bible who would fit that category and Jesus told him: "You must be born again." It does not mean either, that a person must merely follow his conscience and be as sincere as he can, for a man called Saul did that and he was told by Jesus that in reality he was opposing God. You can actually be religious, sincere, good living, morally upright and still not be a Christian. Becoming a Christian means much more than giving up certain habits and steering your life to avoid clashing with the law. In order to show you simply how to become a Christian, let's bring the facts a little more into focus. 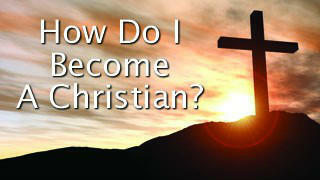 It's simple as ABC, so here it is – the ABC of becoming a Christian. Every man and woman in this world is a lost sinner. No-one can escape this position, for the Bible says, "All have sinned and come short of the glory of God." We are lost because God is holy – absolutely good and morally perfect – and He will allow no sinful person into heaven. We are so lost that without God's help nothing can be done to save us. As a result of sin, we have lost our likeness to God, our love for Him and deserve eternal punishment. We must take our place before Him, firmly acknowledge this and turn from our sin to the Lord. "Lord Jesus, I acknowledge that I am a sinner. At this very moment I confess my sin and believe in my heart that you will save me. Make me a Christian now and help me to tell someone today that I have found you as my Saviour. Amen."